Like all good things in your own backyard, you tend to take them for granted. I’m a little embarrassed to admit this, but at the ripe age of 30 and after several years of ‘wanderlusting’ around the globe, I hadn’t really paid a lot of attention to my own beautiful country and unbelievably, this was my first ever road trip to the Isle of Skye! We were excited to compare Scotland to our road trip around New Zealand! It might sound a little cheesy, but this road trip will forever stay in my memory as the first time I discovered my own piece of the real Scotland. And wow. What an incredibly dramatic place it is. We’re lucky enough to base ourselves here for a few months of the year, filming wedding videos across Scotland! 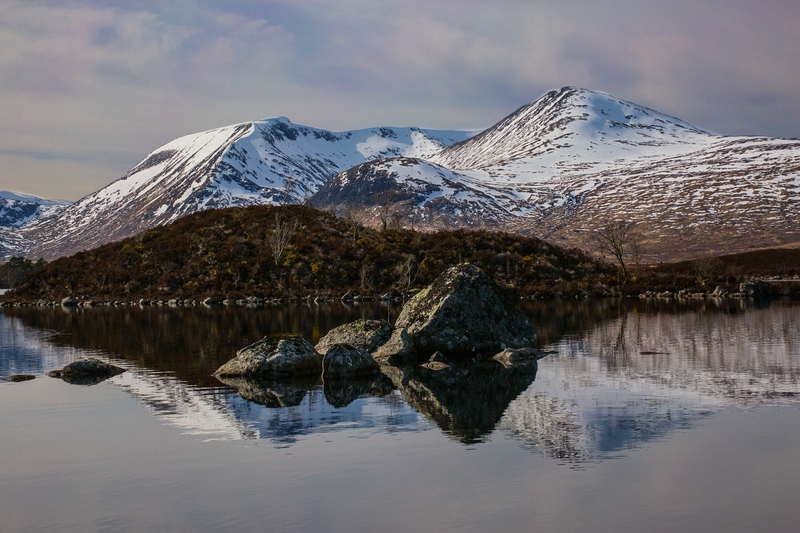 First up on our ‘must stop’ list is the desolate and intriguing Rannoch Moor. 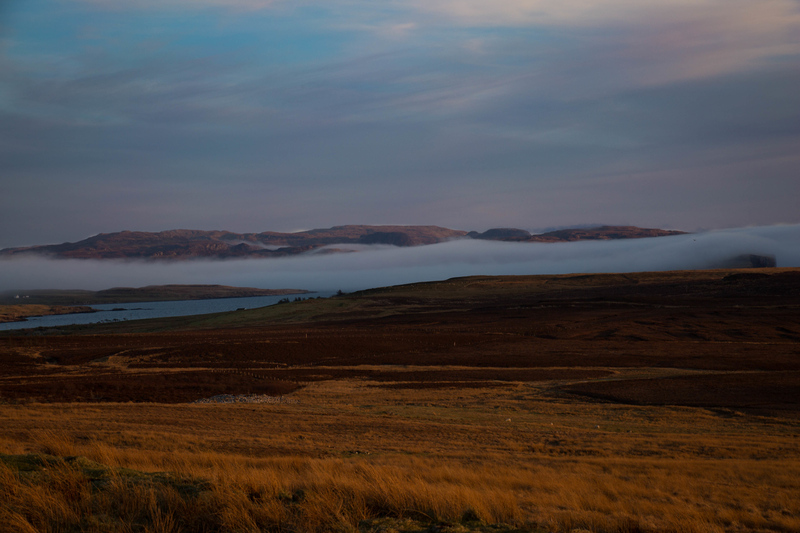 Consisting of a huge expanse of around 50 square miles of boggy moorland composed of blanket bog, lochans, rivers, and rocky outcrops, this really is dramatic Scottish landscape at its best! You’ll find this particularly beautiful spot to the west of Loch Rannoch and conveniently, we drove right by it en route north on the A82 near the Bridge of Orchy. We couldn’t believe we were only a couple of hours into our journey from Glasgow. It’s safe to say it totally blew us away! 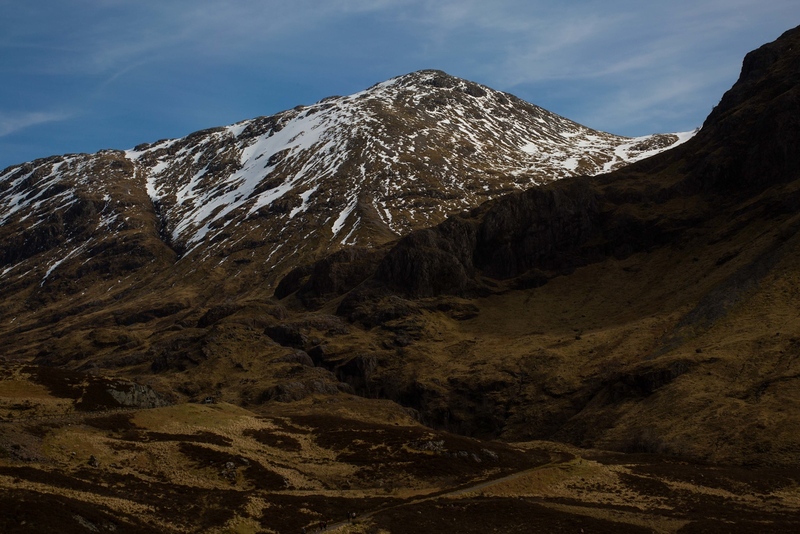 Close after Rannoch Moor you’ll quickly reach one of the most dramatic and scenic vistas of the journey so far. Ok I know what you’re thinking…I’m probably going to use the word ‘dramatic’ a lot, sorry but it’s true! This truly wild open space is completely surrounded by green hills and snowcapped peaks. And if that’s not exciting enough, it’s made all the more special by spotting one of the small 2-carriage trains skirting the hills in the distance on its merry way to Mallaig on the ‘West Highland line‘. We were lucky to see one and took great joy in watching it make its dramatic (oops there’s that word again) loop around the hills overlooking Loch Tully where the train line practically hugs the hillside. Can you spot the train in the picture below? Despite taking the trip in early April, the weather was on our side. That’s just the thing with Scottish weather though, you never really know what you’re going to get, but at least it’s a pleasant surprise when it works out! 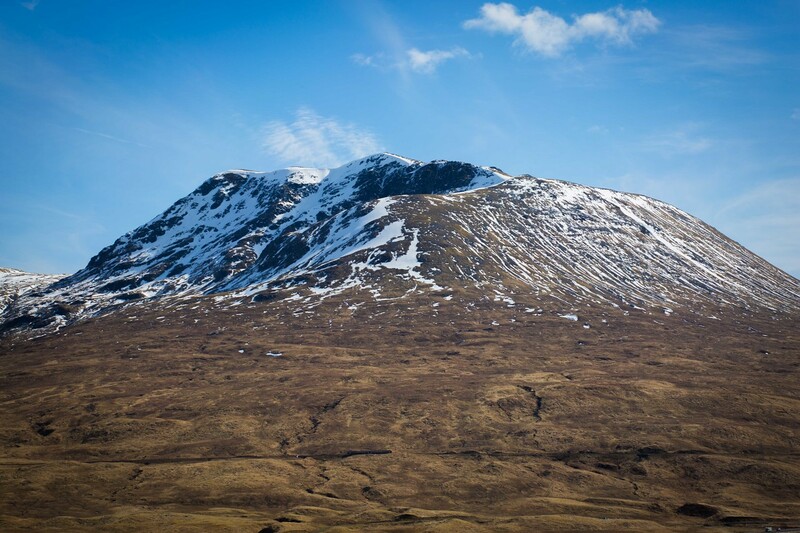 Another image we captured nearby to the Bridge of Orchy and just before arriving to Loch Tulla was this view towards the beautifully striking munro Beinn Dorain, a gaelic name meaning ‘hill of the otter’ or ‘hill of the streamlet’. 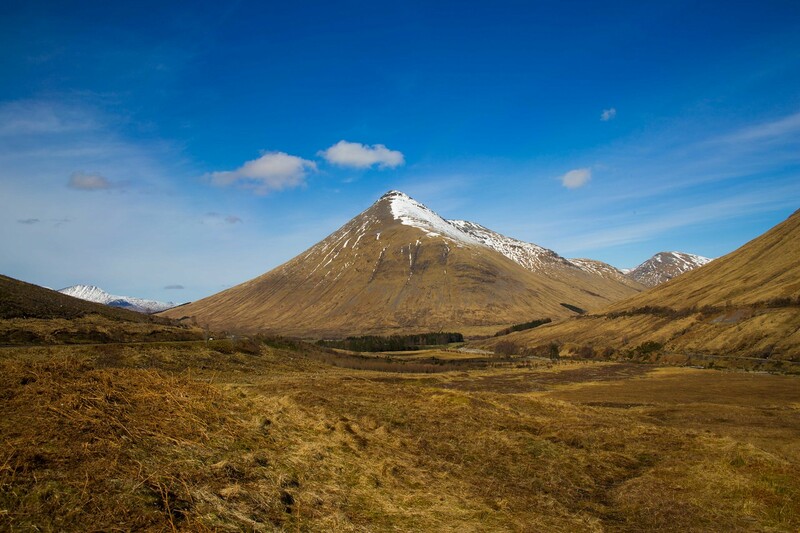 Less than half an hour further along the A82 will bring you to the famous Glencoe area where there are so many stunning viewpoints, it’s impossible not to make a few stops and even a walk if you have time. You’ll find this rugged and rather moody landscape near Ballachulish. We recommend taking a short walk around this beautiful area and there’s plenty space for parking which is handy. Approximately one hour’s drive from Glencoe, and just after turning off the A82 onto the A87 near Invergarry, we got our first westerly view and boy was it worth the wait! 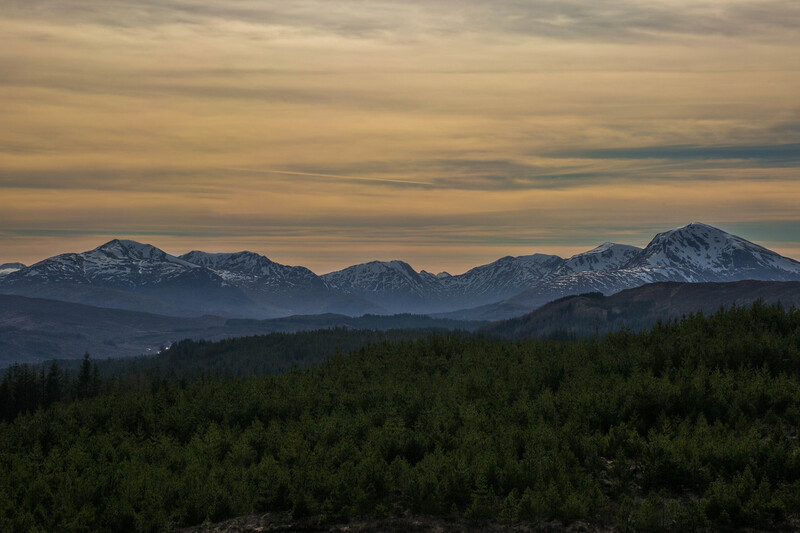 By this time (around 5pm) the light was starting to change providing warmer tones so we couldn’t resist stopping to enjoy this beautiful view of the distant mountains of Knoydart overlooking Loch Garry. 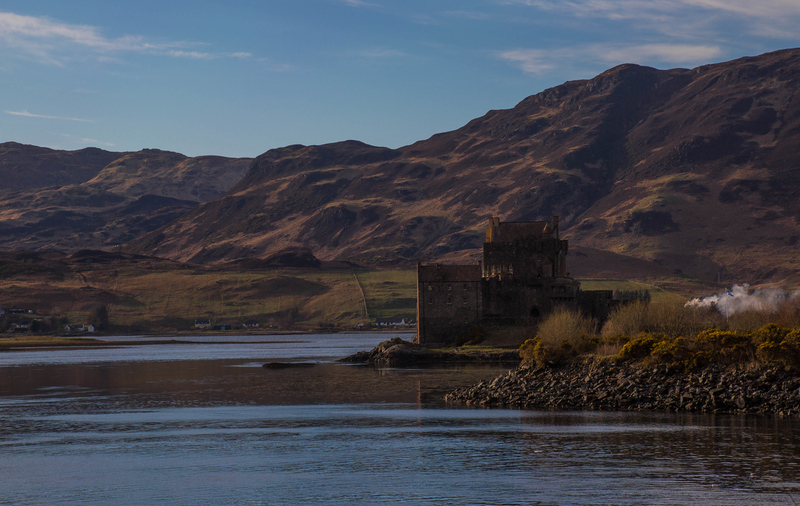 No road trip to the Isle of Skye would be complete without the iconic Eilean Donan Castle shot, so we just had to include it in our ‘top 10’. This was the moment we saw it for the first time and it was easy to understand its popularity! Beautifully positioned on a small tidal island, where three lochs meet (Loch Duich, Loch Long and Loch Alsh) for hundreds of years, with just a footbridge connecting the island to the mainland. It’s a very ‘bonnie’ sight indeed! So after MANY photo stops and the necessary coffee break, we finally made it to the Isle of Skye! It was a mere 10 miles along the road from the Castle to the bridge connecting the mainland to Skye. By this time, we noticed the sun starting to dip so we forced ourselves to reduce our stops and keep going in order to make it to a couple of special view points on the island in time for the golden sunset hour. Never before has the term ‘rugged’ been so appropriate. 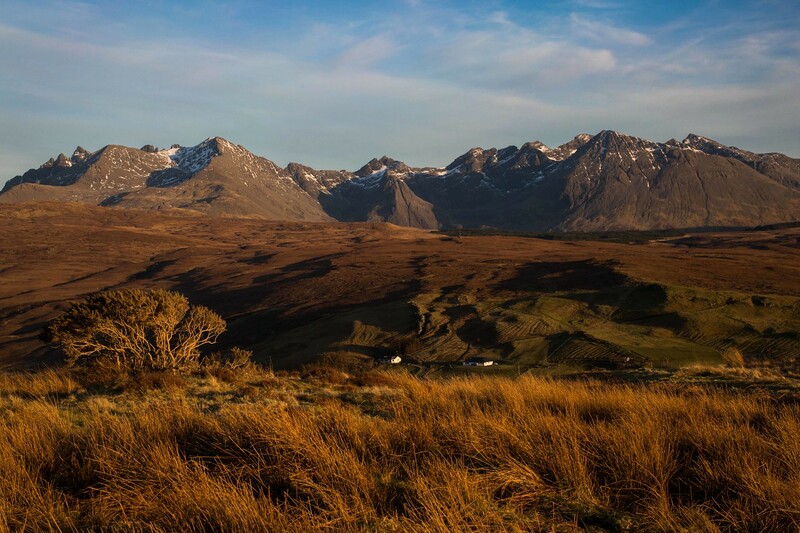 We’d heard Skye described as wild but beautiful before, and we could see why! 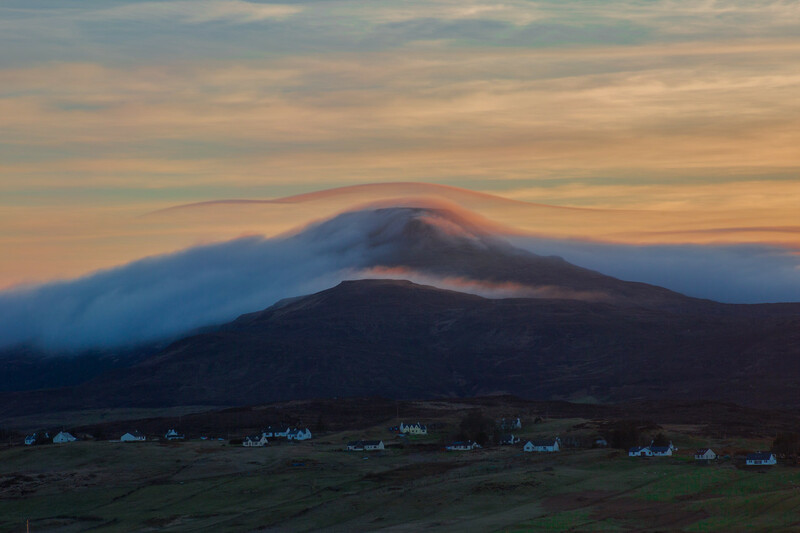 Further along the road towards Dunvegan that same evening, our luck continued when we got to witness this beautiful mountain view shrouded in low misty clouds above the white croft cottages of Roag, nestled by Loch Vatten. What a sight! And we couldn’t resist this final shot taken on the last stretch of our epic Scotland road trip, just before the light finally faded to dark. What an amazing end to an incredible day! It’s safe to say that Scotland has some pretty epic scenery, much of which we’ve still to discover, but in one single day we felt like we’d made an amazing start! We’ll never forget this road trip and can’t wait to explore more of our beautiful home country, so watch this space for more to come on the blog. In the meantime, we had a busy but amazing couple of days on the Isle of Skye where Barry filmed his first ever ‘elopement’ wedding. To see the highlights, hop on over to Barry’s wedding video site here. Looking For Accommodation In Scotland? If you’re looking for some accommodation options in Scotland, we recommend you check out Agoda.com. Whenever we’re making plans for a new destination, we always research the accommodation options first to check what’s available. That’s just our travel style. 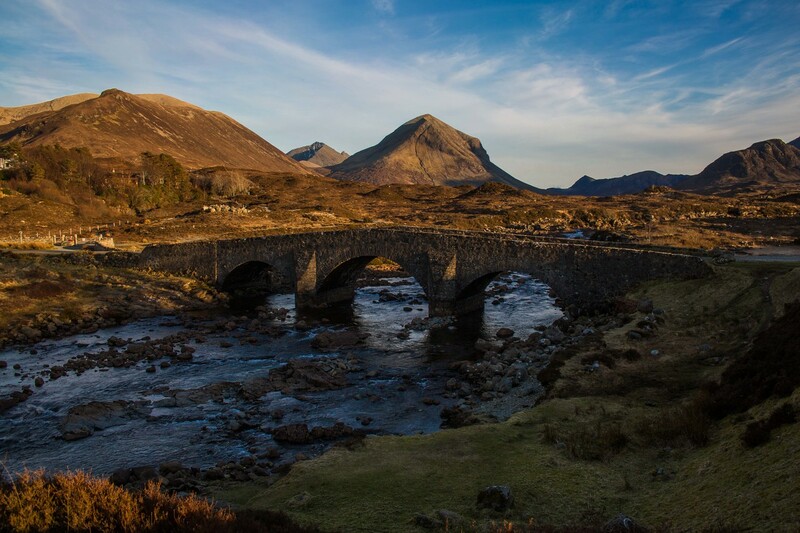 If you want to get some accommodation ideas on Skye, or anywhere else in Scotland, click here.